A complete holidayflat with two rooms in Munich. In your own attic flat you will be able to enjoy your stay with two rooms, kitchen, bath and a separate entrance. The bedroom is functionally furnished with two single beds (90x200, possible to combine) and a locker. In the living room you will find, beside the home likely decorated cabinet wall, a further bed (100x200 cm) and a daybed (140x200). There could sleep further two persons. In the bathtub you can relax after an arduous day or just take a shower. The completely furnished kitchen is perfect to cater yourself. You will have a ceramic stove top, a microwave, a dishwasher, a percolator as well as a refrigerator. A small dinette is available, if you like to eat in the kitchen. Also a flat television with full satellite reception, a hi-fi unit and a cordless phone is at the disposal. Naturally your notebook or smartphone finds a connection to the internet by WiFi. The flat is at the third floor and is only reachable by stairs. Overall Fabulous! Spacious, clean and always quick host responses. Perfect little flat for our Munich stay! The apartment was in a fabulous location for our group of 4 exploring Munich for the first time! It was spacious, homey and the kitchen had everything we needed to cook homemade meals! This apartment is wonderful and I would highly recommend to anyone staying in Munich! This flat was very clean, well appointed and within easy walking distance to grocery stores and local transit. Downtown Munich was easily accessible by the S-Trains and the U-Bahn. Although it was at times inconsistent and limited, the free Wifi was a nice perk. Local gas station facing the bedroom/living room windows could get loud at night, but overall this flat was very comfortable and really good value! Additionally, Frau Hastetter was very personable and had lots of info in the flat to help orient visitors to the area. 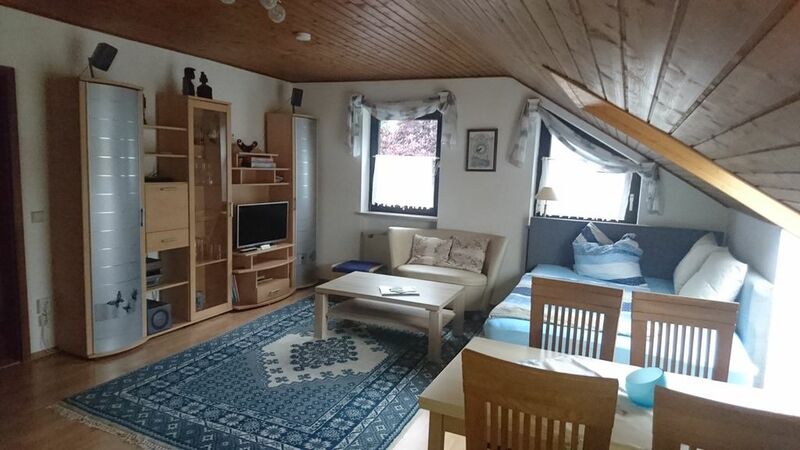 We would definitely recommend this property to others visiting the Munich area. The flat was very clean and had everything to feel like at home. The landlord Frau Hastetter was very nice and helpful. The locations is great: quiet street with possibility to park for free, close to a grocery shop, highway, public transportation and the city center. We were very happy and would return anytime we go to Munich. Hello, we are two couples and a baby that spent one week in Munchen. This appartment is well sited, near of the city center and of the public transport as well. It is a quiet neighbourhood, but you can go to several supermarkets walking. We had our car parked at the same street. The appartment was well furnished, we had Internet,a kitchen full of the necessary kitchenware and household appliances to cook. All very nice and clean. Anna and Stefan were very kind and helpful. Your flat is in Munich-East, the district is called Ramersdorf. The next busstop is 4 walking minutes away. From there it takes just 2 bus-stations to the next U- and S-Bahn Station called 'Giesing Bahnhof' (underground-station). Alternatively you can walk 10 minutes directly. From there it takes 12 minutes to the city-center. The underground goes also directly to the fairground and needs around 20 minutes for that. Reachable by feet is a tennis court or by underground a public indoor swimming pool with sauna. A open air bath is at the summertime also available. Shopping possibilities for food are also reachable by feet. There are two discounts and drugstore (Lidl, Penny and Rossmann) If you like, a Burger King or others snackbars or delivery-services are reachable in arount 5 walking minutes. If you're planning a journey to the Alps or Austria, the highway A8 is just 2 minutes away. For that you can rent a car at 'Europcar' located in the direct neigborhood.